Jill attended Virginia Tech in Blacksburg, where she a graduated with a BS in Animal Science. She has been at the Hospital for Large Animals for almost 11 years, currently holding the position of Senior Technician. Jill worked in the equine industry for many years. Becoming a Veterinary Technician allowed her to expand her knowledge of horses, as well as the other species of animals that are treated here at the Hospital for Large Animals (HLA). 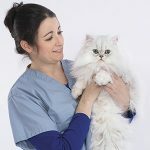 Working directly with the HLA patients and clients, she has opportunities to treat patients, teach students and assist the Veterinarians on a regular basis. She takes pleasure in working hand-in-hand with her fellow Technicians to train students, visiting interns and staff on all aspects of large animal veterinary medicine. 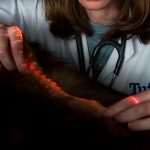 Jill feels that this combined knowledge, in an environment like Tufts, is passed on to future generations of veterinarians and technicians. She finds the process of teaching to be the most rewarding aspect of her job. 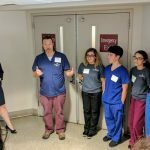 “Helping students overcome their fears about working with large animals such as horses, goats or camalids — which they may never have even been close to before — is gratifying for me. It lets me know that I have made positive impacts on the students and their careers as veterinarians. Jill’s outside interests are exactly that, “outside!” She enjoys water sports in the summer time: skiing, wakeboarding, swimming. In the winter she stays busy as well: skiing, snowboarding, and hiking. She says she likes vacationing as much as possible, and spending as much time in the sun as her schedule will allow. When not moving at a seemingly relentless pace, Jill enjoys kicking back with her two Labrador Retrievers, Ava and Arthur.